Active8 is an all-in-one point of sale system, connecting the online experience with the in-store, for an enhanced customer experience. The Active8 software suite provides trampoline parks, climbing centers, soft play centers, and other active entertainment centers with an all-in-one software solution that seamlessly connects the customer to the park. Our cloud-based system allows customers to complete everything from purchasing tickets and booking birthday parties to completing waivers online. 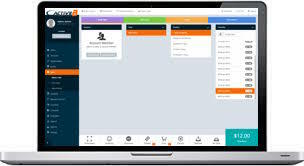 Entertainment center owners, operators, and staff are able to schedule and manage employees, complete point of sale transactions, manage events, and more on one intuitive platform. Find out about our online customer accounts, our self-serve kiosks, our mobile pos, and dedicated support team. Are you ready to see how we've revolutionized the industry? Book a demo now!